Ever think about growing your very own Dwarf Mandarin Tree? Of course you do! How great would it be to have a mandarin tree for you to pick your own favorite citrus fruit from? Mandarin fruits may be small, but they are always BIG in sweet citrus flavor! Easy to peel for little or older hands, they are always delicious and healthful treat. If you want the convenience of having your own dwarf mandarin tree, we can help make it happen. These dwarf mandarin trees make wonderful specimens in your yard (if your winter climate isn't too severe). Live in a colder location? No problem. 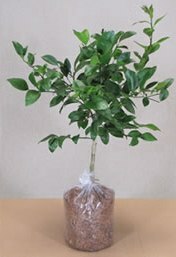 Dwarf citrus trees make spectacular indoor container trees too!